There is an awful lot to keep you busy on the farm at this time of year. So much so that it’s not hard to neglect your tractor and wagon tires. You get up in the morning, get a good breakfast, and get right to work. Checking the condition of your tires is a task that can easily fall by the wayside. Begemann’s words are good advice. She isn’t the only one that recommends daily tire checks. Several people she interviewed for her piece agree. One engineer told Begemann that air pressure is one of the most important things to check on a daily basis. Tire pressure that is too high does not necessarily result in critical damage right away. However, it does cause uneven tread wear. Over time, this uneven wear can reduce the life of even the best tractor tires on the market. Under some conditions, excessively high air pressure can also mean less traction out in the field. A bigger problem for tractor tires is pressure that is too low. You might want low pressure in the field in order to maximize traction in wet, soggy conditions. But low pressure is a tire killer on both the open road and hard soil. If you have to take your tractor from one field to the next on a paved surface, make sure your tire pressure is where it’s supposed to be before you embark. The damage from under inflation during open road driving can be significant. You can lose a good portion of tread or even blow out the sidewall. Beyond tire pressure, Begemann recommends growers check a number of other things. At the top of the list is damage to the outer surface of the tires themselves – particularly the sidewalls. Tire sidewalls take a tremendous amount of punishment in the field. All it takes is a single cut or crack to be a big problem. 1. Tread Depth – The general rule is to replace your tractor tires when they have less than 20% of their tread remaining. 2. 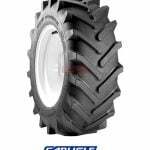 Tread Damage – Stubble has a way of piercing tread rubber and causing damage. A little damage is tolerable; extensive damage may require replacement. 3. Ground Contact Area – Begemann says there should be “no gap between lugs and the ground”. 4. Valve Stems – Valve stems can be damaged in the field. They are also subject to normal wear and tear as a result of corrosion and debris. 5. Lug Nuts and Bolts – Check lug nuts and bolts while you are checking your tires. Make sure everything is secure before you depart. Begemann reminded growers that the amount of punishment tractor tires can take depends on how they handle their tractors. More cautious driving tends to result in longer tire life. Of course, there are other factors that can affect tire life as well. The condition of the grower’s fields, how often the grower has to take a tractor on public roads, etc. You should be checking your tractors tire every day if you want to maximize tire life. When it is time to replace your tires, Mytee Products has what you need. CTV news in Vancouver, British Columbia (Canada) aired a shocking story back in December 2014 following an accident involving a flatbed rig carrying steel beams on Highway 1. The truck driver was lucky to walk away with only minor injuries in what could have been a fatal incident. His experience serves as a reminder of why headache racks are so important. The tractor-trailer headache rack is a lot like those drop-down oxygen masks in commercial airliners. They are there if you need them, but you hope you never have to actually use them. But life doesn’t always go that smoothly. 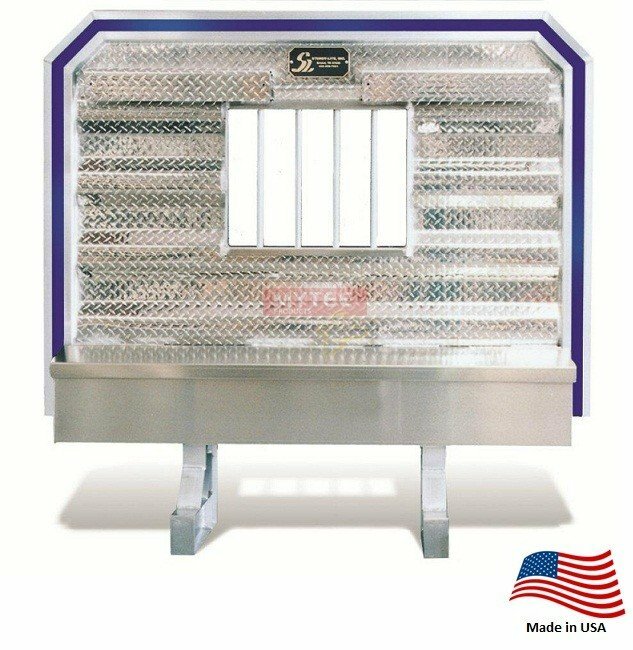 All across the country there are tractor-trailer drivers who do their jobs with the peace of mind that comes with being protected by a headache rack. But there are trucks not fitted with headache racks. More often than not, they are used mostly for local delivery operations. We get it that some motor carriers do not believe investing in headache racks is a wise use of valuable financial resources. If you’re running a local or regional operation that dictates most of your trucks travel fewer than 100 miles per day, it’s easy to view the headache rack as an unnecessary accessory. But the moment a headache rack saves a driver’s life, you realize just how important the investment really is. For the record, the driver in the 2014 Vancouver accident was not charged in the mishap. Local police said that his load was properly secured and that his truck was not overweight. Still, two of the steel beams on his trailer shifted forward when he hit the brakes too hard on an off-ramp. One of the beams slammed through the back of the truck, the front windshield, and across the hood. The front of the beam landed on the pavement while the rear of the beam remained inside the cab. In what can only be described as a miracle, it completely missed the driver’s head. Just a few inches to one side and the driver could have been decapitated. The point to make here is that even a properly secured load can break free under the right conditions. Here in the States, flatbed truckers have to use extra straps when there is no bulkhead on the flatbed trailer, but even extra straps are not foolproof protection. The headache rack isn’t foolproof either, but having one is still safer than not having one. From our perspective as a dealer in trucking equipment and supplies, we see an added benefit to outfitting all your trucks with headache racks. That benefit is extra storage space. As long as you’re investing in headache racks, you might just as well spend a little more on models that include storage space for straps, chains, bungee cords, and more. It is true that you can get just a plain headache rack with no storage built in. And if budget were your primary concern, that would be understandable. But you still need storage space for all those cargo control supplies your drivers use to keep their loads secure. All those things have to be stored somewhere. A headache rack with built-in storage reduces the need for externally-mounted toolboxes. They definitely eliminate the need for you to store equipment on the back of the trailer; equipment that also needs to be tied down to keep it secure. That moment a headache rack saves a driver’s life is the moment you realize how important headache racks are. So, are your trucks properly equipped? A father and son from New Zealand recently competed in a fence installation contest that resulted in the younger competitor beating the older. Apparently, the competition is an annual event at the National Agricultural Fieldays in Hamilton, New Zealand. And while speed may be important to winning the Golden Pliers competition, getting it right is more important in a real-world setting. Here at Mytee Products, we sell a complete inventory of fencing materials including energizers and wire rope. We are careful to encourage customers who visit our Ohio showroom to take their time and do things right. Getting it right is more important than speed when you are installing a fence designed to keep your cattle in. Getting back to the New Zealand competition for just a minute, 47-year-old Shane Bouskill apparently decided to retire from competition after being beaten by his son Tony. The younger Bouskill, just 28 years old, won the competition in grand fashion. He brought an end to his father’s four-year reign as champion. Tony’s father was already planning to retire even before this year’s competition got underway. But he convinced his father to give it one more shot. Shane Bouskill ultimately finished fourth. The two teamed up in a separate pairs competition which they won for the second straight year. A day after the competition, Tony was back to work installing fences for customers. He said he’s not sure if his father will retire only from competition or from fence building entirely. In either case, father and son do very well for themselves building fences for farmers, cattle ranchers, and anyone else who needs them. Fence building competitions aside, there are right and wrong ways to install electrified fencing. A property owner going electrified rather than barbed wire has a few considerations to think of. For example, the chosen energizer for any given fence has to be proportional to the amount of fence being powered. Attempting to power too much line with an inadequate energizer results in ineffective fencing. ” The Number of Posts – Electrified fences do not require as many posts as barbed wire because the tension on the wire rope is not nearly as high. But that does not mean property owners can skimp. They still need the right number of posts correctly positioned in the ground. ” System Grounding – Electrified fencing needs to be properly grounded in order to function. It is not uncommon for inexperienced property owners to damage their systems due to improper grounding. ” Number of Lines – Electrified fencing doesn’t require as many lines as its barbed wire counterpart. Still, a fence cannot have any big gaps between lines if it’s going to be as effective as possible. Three to four lines is generally recommended. ” Backup Power – The one downside to electrified fencing is that electricity can be knocked out in a storm. It is wise to design a fence with backup power in mind. Whether that means a solar-powered energizer, battery backup, or running a generator during power outages is less important than actually coming up with a workable solution. It is great that the Bouskills can install electrified fencing in record time. But once the annual competition in New Zealand is over, father and son go back to work with a focus on doing things right. If you have to choose between speed and a by-the-book installation, always go with the latter. Getting it right is always more important than doing it quickly. With spring planting now a distant memory, it’s time to start looking forward to harvest. Where corn silage is concerned, that means planning now if you hope to have the best possible crop in a couple of months. It also means paying attention to moisture levels. Like most grains, moisture content is critical to how well corn stores after harvest. According to Drovers and PennState Extension, moisture content at the time of harvest is “one of the most important factors influencing corn silage quality.” The key is to match moisture content with the type of corn silage utilized. Growers should be using state-of-the-art moisture testers to determine moisture content before storing corn in their silos. Different silo configurations call for different moisture levels at silage time. Professors at Penn State say that corn destined for horizontal silos should have a moisture content of 65% to 70%. A tower silo calls for moisture content of between 63% and 68%, while limited-oxygen silos require 55% to 60%. Growers should target 65% moisture content for any corn destined for silo bags. Why such variations? Because different silo configurations allow for different levels of air movement. Growers ideally want to find that sweet spot between moisture level at the time of harvest and the amount of air the crop will be exposed to during silage. Drier corn is more susceptible to mold and spoilage as a result of trapped air in silage. Excessively moist corn tends to lose some nutritional value thanks to poor fermentation and seeping. The good news is that moisture testing is easy. It doesn’t take much to pull a handful of grain, put it in a tester, and read the result. Regular testing as harvest approaches keeps the grower fully informed of how his or her crop is doing. Having said that, the experts at Penn State say moisture levels should always be measured with an accurate tester. They recommend against estimating. PennState Extension recommends first measuring moisture content just as the milkline appears on the crop. The harvest date can then be estimated by applying a standard dry-down rate. A rate of between 0.50 and 0.75 is acceptable under most conditions. But also remember that the result is only an estimate; growers concerned about accuracy can always continue testing until harvest. Knowing what we know about testing grain moisture levels, what Drovers and PennState Extension say about corn silage makes perfect sense. We are not experts in corn silage by any means. However, we are experts in moisture testing equipment. We have a full inventory of moisture testers for a variety of needs. We recommend one of our top loading grain testers for your corn prior to silage. If you also grow hay, we have a number of portable rod testers for keeping track of moisture levels in baled hay. Each one of our testers is made to the highest possible standards for many years of reliable service. We know how important accurate moisture level testing is for the American grower. Crop moisture levels can mean the difference between maximizing a crop and sustaining heavy losses. We obviously don’t want our customers losing significant portions of their crops due to not keeping track of moisture levels. If you grow corn, now is the time to start thinking about harvest and silage. Remember, different silo configurations call for different moisture levels in harvested corn. If you’re not sure about your own crop, your local cooperative extension can probably help. Anyone who thinks car hauling and towing is easy work has never done it for a living. Working as a tow operator is one of the most dangerous jobs in America thanks to the combination of weather, other drivers, and the generally hazardous nature of trying to recover vehicles that may not necessarily be in the safest locations. The best tow operators, also known as towmen in the industry, know that they are only as safe as the equipment and strategies they employ on the job. Here at Mytee Products, we have the tools tow operators need. From auto hauling straps to chains and winches, we can properly equip any truck for just about any job. Whether a towman is using a flatbed wrecker or traditional tow truck, it is a good idea to position the truck as close to the vehicle as possible. The less pulling over open space required, the safer things are for both the tow operator and the vehicle being recovered. Along those same lines, getting the truck perpendicular to the vehicle is ideal. A perpendicular position reduces stress on winches and cables. Your average towman works alone except on especially complicated recoveries. It is up to him or her to properly load the vehicle, strap it down, and get back on the road safely. Having said that, experienced operators know it is always wise to use a spotter when one is available. A spotter keeps an eye on the recovered vehicle as it’s being loaded onto the back of the wrecker or hoisted by the hook. Obviously, the spotter should be an experienced operator is well. The next tip is a matter of both law and safety. According to federal and state laws, tow operators must use properly rated straps and chains to secure vehicles to tow trucks. That means operators have to know a little bit of math to do what they do. The general rule is to use straps rated at 2 to 3 times the weight of the vehicle being recovered. The stronger the straps, the more secure the vehicle will be when accelerating and braking. When loading a recovered vehicle onto the back of the wrecker, the experienced operator will make use of the factory tow hook for both winching and tying down. The tow hook is the strongest point on a car for these sorts of operations. Not using it is ignoring something designers put in place specifically for recovery operations. Wrecker operators should always utilize four points of contact at a bare minimum. Chains and straps should be deployed at 45° angles in order to reduce both parallel and perpendicular movement. Four points of contact will keep the recovered vehicle in place better than three, and a lot better than two. It takes time to learn all the tricks of the towman’s trade. We cannot offer you either the time or the on-the-job training you need to be the best in your industry, but we do have a full selection of towing supplies and tools to keep your truck fully equipped.